Committee meeting are held once a month and usually last 45 minutes to an hour. The committee is responsible for developing centre policies, fee schedules, session times and staff recruitment. Joining the committee is a great way to get involved and get to know other parents and staff. By joining the committee you will know what’s happening at the kinder and have a say in how the kinder is run. 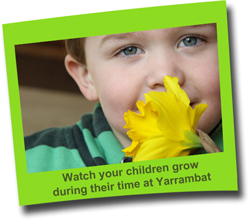 At Yarrambat Plenty Preschool we aim to carry out at least one fundraiser per term. This is discussed and decided on by the committee at the monthly committee meetings. All funds raised are used to improve the kinder program – be it new equipment to aid in the development of our children or an appropriate incursion to relate to a current theme that the teachers are working on. We would encourage all parents to get involved where they can and support our fundraisers. If you have any ideas or can assist in any way, please let us know. There are two staff on duty at the kindergarten at all times. However we always need help with such things as; assisting with activities. These times are also a great opportunity to see first hand how your child is going at kinder as well as see for yourself the running of our program. It is also an ideal time to mention any concerns that you may have about your child to the teacher. If needed extra time can be put aside to pursue these concerns. It is your decision whether to bring along any younger siblings/ toddlers whilst on duty, you will know whether your younger child will require extra attention and inhibit your involvement. Parents and other family members are invited to come along to kinder. Children love to have their special person come and join them in the kinder fun. Help rosters are located next to the sign in book in the foyer of the kindergarten, please write your name down on the date you are able to attend. Occasionally there will be some washing to take home, each family may have one or two turns a year. Each child has an individual pocket. The pockets are divided into each kinder group and are located in the foyer. These pockets are used for fee invoices and receipts, notices, permission forms and any other correspondence. Yarrambat Kinder is listed on the Bushfire At-Risk Register and we do not operate on Code Red or Extreme Fire Danger days. Our ‘Bushfire Policy’ is available at kinder for you to read.